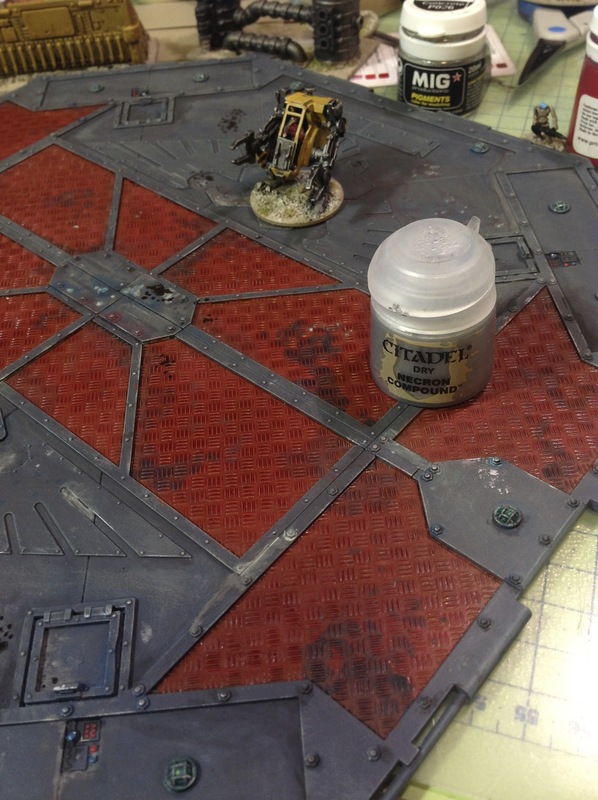 I am putting the finishing touches to this Games Workshop launch pad which I am using for 15mm gaming (using smaller legs and not adding the side panels). 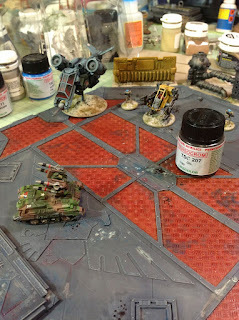 It is the plastic kit they sell and I am using it on the terrain board for the Salute Wargames convention and it will be part of the scenario for 15mm sci-fi rules Gruntz. I used one of the Citadel shades on the red metal work section and the Necron Compound which is a dry paint they provide for easier dry brushing. I was painting it very quickly, because I am short on time. So rather than airbrushing and masking different areas off I just used a P3 Paint called Greatcoat Grey for the main areas and Bloodstone as the brown base in the centre metal plated area. It is going to be placed on an frontier world Mesa desert style board so I wanted it to look burnt up, scratched, dirty with scorch marks from use. So I went to town with lots of pigments from MIG and washes from lifecolor to give it a weathered and worn terrain look. In the centre red area I used a dark flesh wash from the new Citadel 2012 range called Reikland Fleshshade which is in the shade range of washes. It had a bit of a surprise problem! I wanted something with a dark red tone to complement the reddish brown base colour and it went on smoothly but dried gloss in the corners and over the main bulk of the platform it also added a slight shine. I think as a wash it is clearly very much like an ink and less like the very matt washes when compared to the older paint wash range like Badab Black and Devlan mud. The situation is very easy to resolve, because when I dull coate the terrain piece with matt spray it will remove the gloss shine but it is annoying to discover that as more of an ink you are going to have to adjust painting a bit to handle the gloss shine. However I did also use the same Reikland Fleshshade on a practice 28mm model as a wash over the flesh and it did not become shiny when used in small amounts. I think it is a shame that it does not have that very matt look of the older ranges but looks like it will be OK to use on normal small scale washes on a model. 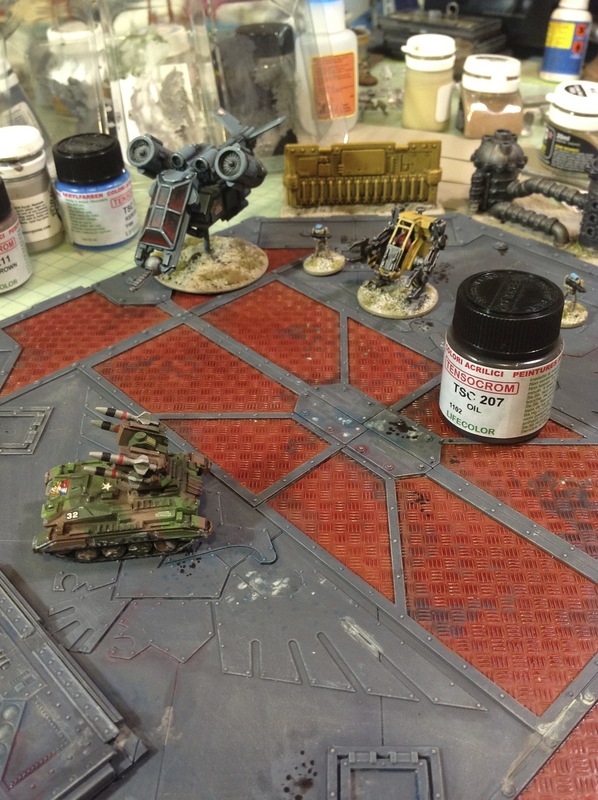 If, like me, you like to use them on larger terrain items, buildings and vehicles you may find that the shine from the ink starts to come through again. One amazing revelation was the Necron Compound Dry Paint. It really does offer the best dry-brushing experience of any metallic paint I have tried. You can use a small amount on the brush and get the finest of edges agains the panels, rather than the older method where you might have to spend a while making sure the paint was dry on the brush by repeated brushing against a tissue. It certainly added the finishing touch to the panel edges which I wanted to give a worn and scratched look to and was subtle. In a previous article on LifeColour Italian paints Lifecolor paint review I discussed the interesting washes they have in the range. The launch pad was perfect for them because the various oils, smoke, kerosense and fuel in the Tensocrom set 2 are the sort of liquids you might expect to have leaked out onto the Games Workshop launch pad. I was most impressed by the Oil which drops on with a high surface tension (much like oil) which gives you a really greasy puddle look to the result. 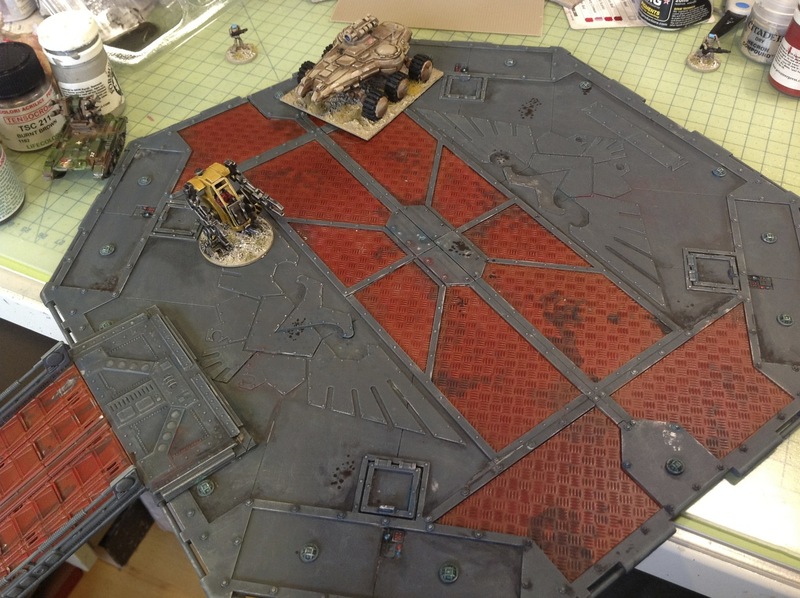 I also used the smoke to add burnt areas on the red platforms panels. This final photo is after I applied a matt varnish spray. It really dulled down the shine coming from the new Citadel wash. I also used a small selection of pigments on the platform. You can see them in the corners and edges, adding a darker shade and in some areas where there are dusty patches. Pigments, unlike paint, don't fix themselves to a surface and come in a pot like a dust. When you mix them with a few drops of water you can spread them on the surface with a normal brush and let them dry. They are more subtle than some of the ink washes and allow you to blend just by adding more water or by using the MIG thinners. Using thinners will seal them better but if you are going to use a varnish coat they will also be sealed by the spray. I have found that I can go back over an area with a pigment by applying more thinner to make a shade more subtle if I have gone on to heavy with the pigment. Having this large platform to practice on helps, you can't go wrong because you can explain away any mistakes as oil spills, exhaust burns or scuffs. 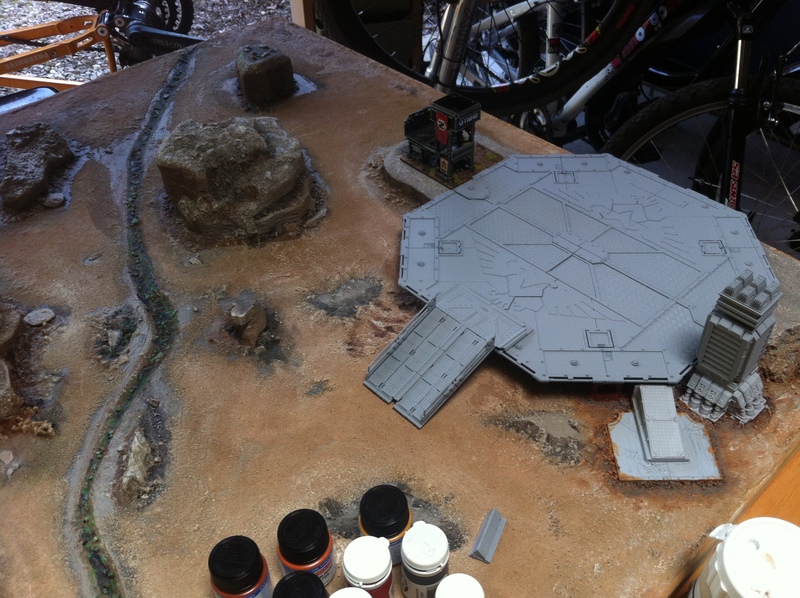 This launch pad will be integrated into the main terrain board by the weekend and ready for action at Salute 2012 at the Excel exhibition centre in just over a weeks time. This post scares me. i use Devlan mud, Badab Black, Gryphonne Sepia and Ogryn flesh wash almost *every paintjob*... Maybe I will have to scrounge and stockpile? @SJ: There are plenty of alternatives I think. I also plan to test my Nuln Oil - it might not suffer the same gloss as the flesh wash. I will share the results. Lets hope it lives up to Badab! I have tried them out today. For the most part, paint is paint. It's not what you have, it's how you use it. I have to say I like the new drybrushing paint and the textured basing material. They make the task easier. Thanks for sharing. A question. I tried to use the dry paint on 15 mm wargaming figures but i didn't like the out come. Perhaps the dries are more suitable with larger minis as 28 mm?